"If I wanted to send you a package, would it be safe waiting in your building until you got home? ", my mother asked. "Sure!" I responded, wondering what was the big deal. I mean, she sends mail from time to time and has never been concerned. So when the package arrived, I was intrigued. I sliced open the box, while absently reading some other mail, until suddenly...."Is she kidding me"! 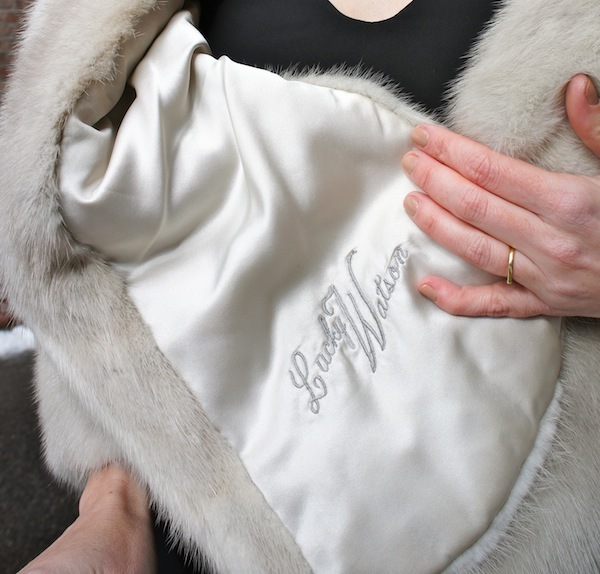 Inside was an exquisite vintage mink stole - an early birthday present. I dashed to my mirror and threw it on, and then may or may not have stood there, admiring myself and stroking the soft fur, until Mr. TBF came home. I called my mom to thank her, and she pointed out the name of the previous owner, embroidered in the lining. Lucky Watson. Does it get any better than that? Can't you just picture Lucky (In my head, she and I are on a first name basis) bombing around Vegas, blowing on dice and sipping a Gibson? FANTASTIC. I just had to take Lucky out for a spin, and what better occasion than opening night of The Sleeping Beauty at The Boston Ballet? Thank you, Mom, for such a singular, special gift. P.S. Anybody know Ms. Watson? I would love to learn more about her! Love the fur stole and especially the story to go along with it! Thank you Lissy! My Mom did well, didn't she? your mum must be so stylish!! my parents are clueless when it comes to fashion :) happy almost birthday and what a great gift! Ahhhhmazing! What a fabulous gift! Seriously gorgeous find! Your mom is fantastic! Lucky is/was a seriously fabulous lady with that stole! It was seriously made for you (and Lucky!). Your mom is the best! Ha - My mom said that when she discovered the embroidery that's when she "knew she had to buy it..."
What an awesome birthday present! I love how you styled it here. such a fun post and story and i love your description of lucky! happy early birthday! haha I absolutely love that story! I actually chuckled too that "you and Lucky are on a first name basis". The stole is gorgeous and it looks like your Mom has great fashion sense too! I hope you enjoyed the ballet!